Hello everyone. I have been working on a Keen 4 mod since last spring, and I decided itÃ¯Â¿Â½s time to reveal it to the community. The title will be Atroxian Realm. I should mention that the word Ã¯Â¿Â½AtroxusÃ¯Â¿Â½ originally came from the Zero X minimod, however if no one minds I will recycle the word. My intent with this is to create a large, unique mod which will take some time and thought to complete. I do not intend to make it incredibly difficult, however, there will be plenty of puzzles, long levels, and unique elements. The mod will also be a bit darker than other mods, and IÃ¯Â¿Â½ve tried to combine elements of many other modders. HereÃ¯Â¿Â½s a small preview. The story will involve Keen being stranded on planet Krisle. He must help an ancient race named the Krile defeat the evil Atroxians and their leader, Atroxus. That's all I'm going to say for now. The mod will include a wide variety of unique hazards and puzzle elements. For instance, it will have electric floors and spikes that can be turned on and off via a switch (itÃ¯Â¿Â½s possible). IÃ¯Â¿Â½m hoping to include a large world map as well as a final level and final boss; part of this will depend on whether itÃ¯Â¿Â½s possible to patch. Current status of the mod: About 9 Ã¯Â¿Â½ of the levels have been made. (They are quite large. IÃ¯Â¿Â½m worried that I will run into memory issues later) Keep in mind that they arenÃ¯Â¿Â½t a final product yet. I will need to finish up some graphics and get the enemies to work. The world map has a basic layout done, but no new graphics yet. About 95% of the platform tile sets are done, but I still to finish up some more background and other in-level graphics. Enemies are about 2% done. I donÃ¯Â¿Â½t really have the graphic or patching skills to make new enemies, so those are still a long way away. I also do not have any other graphics done yet for the title/story/help screens; once again I simply donÃ¯Â¿Â½t have the ability to draw them. Music- IÃ¯Â¿Â½m not that great of a composer, but I do have 3 beta songs possibly made. IÃ¯Â¿Â½m looking for a darker yet still catchy side for the music. I would like to have as much unique music in this as possible. For now, general swamp and crystal themed music would help. Patching- This may be the hardest area. Levellass, I realize you have had a horrible month, and IÃ¯Â¿Â½m deeply sorry, but your patching skills would be invaluable here. Please donÃ¯Â¿Â½t feel like IÃ¯Â¿Â½m trying to force this on you. If you would be willing to help at least a little, IÃ¯Â¿Â½d be honored. Really. Anyone else with patching skills is also welcome. I will probably take care of designing all the levels, but I could still use someone to review them. My style is closer to CK GuyÃ¯Â¿Â½s levelpack (The one difference- I try to make my levels fair and not overly difficult.) I would like someone who enjoys longer, more challenging levels to help me make them as good as possible. IÃ¯Â¿Â½m hoping that a few people would be willing to help me with this. I do have a very good idea of how I want the mod to flow. My time may be a little sporadic (I may not have much time to work on this during spring) , as I have a lot of other things going on, but I donÃ¯Â¿Â½t intend to let it die, not when IÃ¯Â¿Â½ve gotten so far. Also, it is very unlikely, but I do have ideas for making this a trilogy. I do not want to make the mistake of getting ahead of myself. For now, this will be a single episode. Last edited by Gridlock on Wed Mar 13, 2013 21:46, edited 8 times in total. In the first screenshot: the farthest background is incredible. Love the dark chaoticness of it. I also like the platform tops, the green and blue is a nice combo. I don't really like the more foreward background object that is green dithered black: it's a bit too tiled in my opinion. Also the sides of the platforms, I'm guessing, aren't done. In the second screenshot: the red lighting effect is awesome, I bet that takes up a lot of tiles though! Really like the crystal lattice style of the platforms and that they are see through: very abstract. Is that crystal object an enemy? Looks cool and contrasts well with the environment. In the third screenshot: Interesting use of the tube backgrounds from keen 5, I'm not sure if I like it or don't though (seems like the sides could be fully shaded rather than solid strips). Love the platform set, very techy, although the right facing side seems out of place. The blue/black/red lighted background is nice, but it kind of clashes with the platform set in my opinion. Makes it hard to focus on where the action is. In the fourth screenshot, really like the use of steps instead of slopes. How good does that look visually? Awesome looking point items. Nice job making the background look less tiled than those tiles seem like they would require. In the fifth screenshot: nice floor hazards, really like the darkened affect of the one. Nice striped background pattern. Altogether, really awesome, really like all the ways this differs from the typical galaxy style (which isn't bad, but after designing TUIT in that manner, time for something new!). I'd love to help, and will offer suggestions, but this is so neat, I'd rather distance myself than get internally involved with helping with sprites or something; need surprises to look forward to. Again, fantastic looking so far! Wow! Keen 10? Looks very impressive! This year is already the best in terms of mods (Keen9, Keen Xmas). And now this one. Surely a pretender. If you manage to release it this year, it would be freaking awesome. Wow, those graphics are beautiful! This sort of thing really inspires me to want to make a mod. The screenshot look beautiful! Looks like a great mod comming up. I hope you get the support that is needed to finish it this year. Those are some tripsy screenshots. Loving the style. The first screenshot is a bit glary for my tastes, but it's also somewhat retro. The middle three screenshots are just magnificent. I'd like to help out with the graphics, particularly the backgrounds, but I'm already overloaded with thoroughly overdue Keen projects. this is amazing. Am I the only one who feels these graphics are a Cosmo reference all over? Anyway, keep up the good work. I like that your mod looks original on a high quality level. the fourth one looks like TKoK temples on steroids. Last edited by Eros on Sat Feb 05, 2011 17:09, edited 1 time in total. I appreciate all the feedback. Mostly I've had only my own opinion to judge this on. I don't really like the more foreward background object that is green dithered black: it's a bit too tiled in my opinion. Also the sides of the platforms, I'm guessing, aren't done. I definetly know what you're saying. I have been wanting to replace these vines with something that looks better, but have not really wanted to try. There are a lot of tiles for those. Those sides will likely get redone when new vines are made. Just to say, the only recolored tileset in the game will be that one. 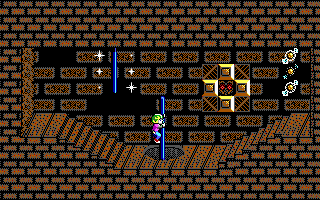 It's actually a recolored version of the pyramid tileset. This is probably my favorite tileset look in the game. The crystal object was a quick object I drew to put something in, I'll probably try to get a better drawing of it. The neat thing about this transparent tileset is that it allows me to do some neat effects to the visuals. For instance, you can see poles and some point objects. I'm looking for some better crystal objects and a better background for this area. 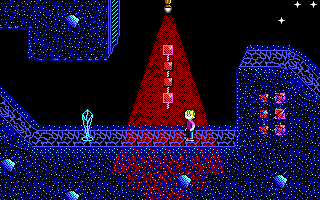 And that lighting effect doesn't take up many tiles, but I hope to add more colors. I'm not entirely pleased with the way it looks however. I'll probably fix up those strips. 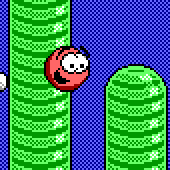 If you saw the rest of the level, I think you would like the way those tubes look. The right facing side is an attempt to add variation to the tileset. I kind of like the way it looks, but I'd like to hear other people's opinions. 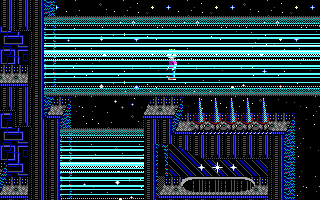 As with that blue/black background, it does sort of clash, but I assure you it won't be used the whole level. That part is kind of one of the highlights of the level. I probably should mention that that is the only screenshot that's just a mockup. I don't have a lot done with the ruins area, mostly because I'm going to have to get past another graphics obstacle. Not entirely sure what you mean by that second sentence, however those steps sure were tricky to do. That background is rather beta, but I like that you liked it. Those floor hazards are in fact electric floors. Hitting that switch will cause the floor on the right to become electricuted and the floor on the left to turn off. I should also mention that the switch can only be used once, forcing a one way passage on the player. Don't worry, I have been carefull with level design to prevent you from getting stuck. I don't have a good swamp background here, and that has hindered progress of the world map, title, and story screen. 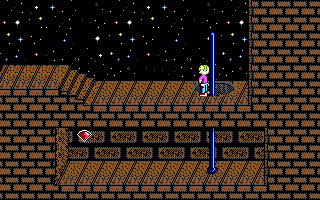 Also, I really need help with some tree platforms, crystal graphics, and technology objects (like in Keen 9) Maybe helping with this wouldn't spoil it for you. Last edited by Gridlock on Mon Jan 02, 2012 3:19, edited 5 times in total. i don't mean to be lazy, but if you *do* happen to stop working on this, can i have whichever tilesets you did finish? they would help in Hayro, especially 2, 3, 5, and maybe 1. Also, my email seems messed up. I tried registering at Keen Modding, but I can't get the email. I was also trying to recover a lost password earlier and I wasn't receiving the email from this forum. Is my email just blocking it? I tried setting the spam filter off, but to no avail. Any other way I can activate a KM account? Last edited by Gridlock on Mon Jan 02, 2012 3:20, edited 1 time in total. Gridlock wrote: But at present I really don't want to quit working on this. Please don't. This is looking/sounding great. It's about time we got a wide array of galaxy mods since Vorticons ones are now boring as hell for me. This year is looking very promising in terms of Keen modding, there's one big title that is about to hit the shelves... I am not allowed to reveal anything about it though. It shouldn't take too long anyway. @gridlock wooow hold on a sec. Your first tileset is going to be a swamp? I mean huh! When I imagined Keen 7 (long before Ceilick's keen 7 went out), I imagined a swamp tileset. Partly inspired by the swam from Heroes of Might and Magic 2-3. But it's only in my head. I could hardly draw it. @ckeen: hyh? someone is making a 3d keen? wiivn wrote: @ckeen: hyh? someone is making a 3d keen? This is a one day progress. Just... how awesome is that?